During the worst blizzard in memory, an FBI agent in a moving SUV in New York City is killed by a nearly impossible sniper shot. Unable to pinpoint where the shot came from, as the storm rapidly wipes out evidence, the agent-in-charge Brett Kehoe turns to the one man who might be able to help them—former FBI agent Lucas Page. Page, a university professor and bestselling author, left the FBI years ago after a tragic event robbed him of a leg, an arm, an eye, and the willingness to continue. But he has an amazing ability to read a crime scene, figure out angles and trajectories in his head, and he might be the only one to be able to find the sniper’s nest. With a new wife and family, Lucas Page has no interest in helping the FBI—except for the fact that the victim was his former partner. Agreeing to help for his partner’s sake, Page finds himself hunting a killer with an unknown agenda and amazing sniper skills in the worst of conditions. And his partner’s murder is only the first in a series of meticulously planned murders carried out with all-but-impossible sniper shots. The only thing connecting the deaths is that the victims are all with law enforcement—that is until Page’s own family becomes a target. 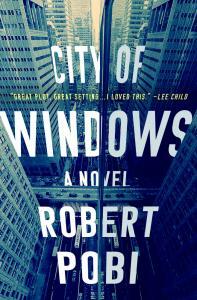 "Robert Pobi has written a winner with City of Windows, a novel that should establish him as an authentic, distinctive and entertaining new voice in crime fiction." "I don't have space to list the many things that are done expertly in City of Windows. Just read it and start watching for Robert Pobi's next book."